Have you ever experienced the sudden feeling that the world around you is moving or spinning? Even worse, you can't stand still and you feel you'll get off balance. Such severe dizziness may happen to anyone unexpectedly. This condition is medically known as "vertigo". Lack of exercise, use of a computer for long hours, and sleeping postures, are some of the major factors of vertigo to most people. Fortunately, more than half of vertigo cases can be cured easily using home remedies! In this article, we'll let you know why vertigo occurs, how you can recognize vertigo, and what type of vertigo can be cured at home. In addition, we'll let you know the latest information on "Meniere's disease". Ear stones (Otoliths) in Ear Canal Can Cause Vertigo! The most common type of vertigo has something to do with "ear stones" known as otoliths. 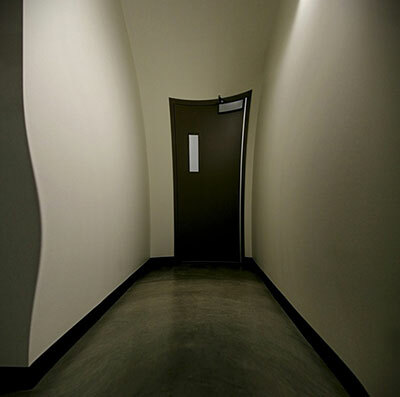 This type of vertigo occurs suddenly and people who encounter it usually never had any prior experience. The frequency can also increase gradually until it comes to the point that it happens every day at length. What Are Otoliths (Ear Stones)? Otoliths sit inside the inner ear and they are responsible in helping you orient your body and keep your balance. They are made up of calcium carbonate structures. These ear stones shift their position as the head is tilted to different directions. These actions stimulate the hair cells, which then send impulses to the brain. In other words, they help create the sensation of motion of your body. Why Ear Stones Can Cause Vertigo? The otoliths can become dislodged (may be due to a head blow or aging) and settled in the semicircular canal, which is the primary sensory system of the inner ear that detects rotational movements. Because of the dislodged otoliths, the sensory hair or hair cells in the inner ear get stimulated even when you are not moving and give wrong information to the brain. This is how the most common type of vertigo occurs and is called "benign paroxysmal positional vertigo (BPPV)". In BPPV, the dizziness will subside if the movement of the otoliths is stopped. If you are having symptoms of dizziness that go away within a minute, then your vertigo is most likely the BPPV type. 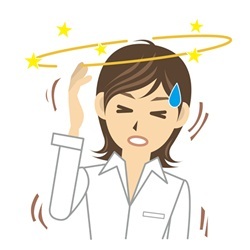 However, if dizziness is accompanied by other symptoms such as numbness in hands and feet, paralysis, or slurred speech, then these can be indications of stroke. If dizziness does not subside after one minute, we recommend that you go to your doctor immediately as it could be a sign of other condition. Benign paroxysmal positional vertigo (BPPV) can be cured if the otoliths are repositioned. In fact, treatments or procedures to do this is available and can be performed by health professionals. Luckily there's also a way to cure this type of vertigo right at your home. Otoliths can leave behind calcium carbonate debris over time and find their way to the sensitive structures in your inner ear. If they only accumulate in small amounts, the hair cells of the semicircular canals may not respond and not cause vertigo at all. But vertigo can occur once these ear stones form a big lump. This can easily happen if you are not moving for a long time when sleeping or lying down. Fortunately, there's a special exercise that you can perform at home. This exercise is widely known as the Brandt-Daroff Exercise! Do the above steps every day for 10 sets each morning and evening. By doing this, the otoliths will less likely form a mass and less likely to gather in one place in your inner ears. It can also disperse otoliths that already formed a mass into finer crystals. This makes this exercise effective both in prevention and treatment. Symptoms may go away suddenly during the exercise, but usually improvement can be seen gradually over a period of weeks. Raise Your Pillow Higher to Block the Entry of Otoliths! Another way to cure vertigo at home employs a technique that helps prevent the ear stones (otoliths) from entering the semicircular canal in the first place. This simple technique is nothing more than raising your pillow higher. 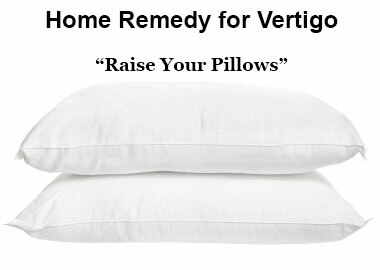 Studies show that people sleeping without a pillow are at a higher risk of getting frequently attacked by violent vertigo. By sleeping in stacks of pillow, dizziness starts to disappear in about 1 week. The rationale to this is that the ear stones are less likely to enter the sensitive structures of your inner ear when sleeping on raised pillows. What You Should Know about the So-called Incurable "Meniere's disease"
Meniere's disease is the second most common inner ear disorder after BPPV that also causes intense vertigo. In addition to severe dizziness, hearing loss and tinnitus can occur. In some cases, the condition may no longer improve. It is really a very challenging disease. Latest diagnostic tests for Meniere's disease are carried out by high-resolution MRI. The use of MRI can help show any abnormalities around the back of the ear. If blisters are found, then it is certain that you have Meniere's disease. These are fluid-filled blisters and it has been proposed that the symptoms of Meniere's disease in many patients are linked to the herpes virus or shingles! Fluid-filled blisters are fluids that are trapped under your skin, which is caused by an excess fluid build-up in the tissues of your body. There are medications available that can help your body release these fluids. Diuretics are one of them, which make your body get rid of excess water by helping your kidneys increase the flow of urine. However, in some cases the above may not resolve the symptoms. Inner ear micropressure therapy and surgery will be your other options. The root cause of Meniere's disease is not well understood by the medical community so improvements are difficult to achieve. This is simply because many diseases or illnesses are caused by reasons that we cannot actually sense such as mental or spiritual problems, and that is where alternative healing modalities like the PYRO-ENERGEN electrostatic therapy machine comes into play. With that said, we strongly believe that the root cause of Meniere's disease boils down to the outside negative energy surrounding the patient's body (read "Root Cause of Cancer and Viral Diseases Revealed"). Therefore, we believe the PYRO-ENERGEN can be a great help for Meniere's disease sufferers! 1. "The 3 Most Surprising Causes of Chronic Dizziness"
2. "Are You Experiencing Insomnia, Vertigo, and Tinnitus Symptoms?"